I used to really enjoy Bones. It was a show I looked forward to week after week. It was fresh and new. The characters drew me in. The cases were intriguing. What happened to that show? 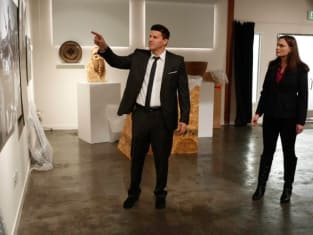 After tonight, it's safe to say I'm back to feeling completely exhausted by the overly emotional manipulation that is Bones season 8. This series is rapidly becoming but a glimmer of its former glory. So far this season we've had tigers, children with debilitating illness, and the girl who was date-raped at a party. "The Survivor in the Soap" was another episode written to teach us more things about which we plebeians couldn't possibly already know. Children in Sierra Leone were forced to become soldiers during their Civil War and many of them immigrated to the United States to seek asylum after the war ended. Let's be clear. I'm not attempting to minimize that piece of history. It was and is an atrocity played out against the most innocent among us and those most deserving of our protection: children. But tonight's blast of pathos via the photographer's gallery and Brennan's snapshots was heavy-handed and unnecessary. And don't even get me started on Arastoo's outburst at Hodgins. They were ways to show us images of what happened, as if saying that the victim in tonight's episode had been a child soldier in Sierra Leone wouldn't have been enough. Or saying "Look! We characters on Bones have been personally affected by this and we feel bad so you should too!" I know, I know: show don't tell is the rule of television. However, not like this. Show us. Don't clobber us over the head with it. Give us a character we can connect with and feel, even if the character is deceased the whole time. With the clunky handling of all of these After School Specials, I just keep thinking back to the case of the Amelia Rose. That was an episode that handled this sort of heavy story beautifully in a way that the episodes this season just haven't been able to do. Tonight the case was so front-and-center that I was annoyed by it. The team was used as fodder for comic relief so that we weren't so bogged down by the devastation that we wanted to change the channel. Except I'd venture to say it didn't really work. Booth and Bones bickering over where to go on vacation felt unnecessarily silly. We know that Brennan likes to go on vacation to places where her skills as an anthropologist can be put to use. We know that Booth would prefer a place where they're getting away from death and destruction. Having them spar about which exotic locale would make the perfect vacation spot was somewhat inane, even if we did get a couple of good Bones quotes out of their exchanges. None of us care that Cam and Arastoo are dating because none of us saw any sort of indication that it was coming at all way back when we learned about it last fall. This is only the third sight or mention of the two of them being together, so there's nothing about that relationship we can care about because we haven't seen it build. It just was. Is. Apparently will be. What did you think of "The Survivor in the Soap?" Were you emotionally moved by the episode? Or just moved to change the channel?